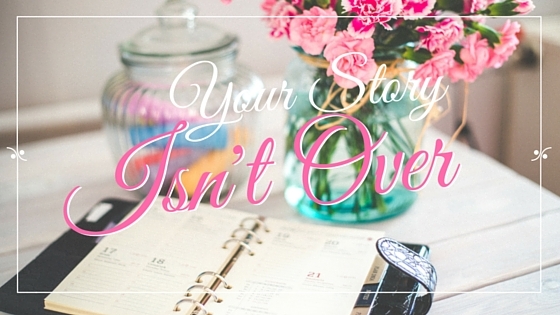 Your Story Isn't Over | Kristen McCall & Co.
One of the hard things about being divorced in your mid 20s is that you’re pretty much the first one to get divorced. Out of my friends group and small group at church and social circle, I was the first one who unfortunately walked through it. Recently, several friends/acquaintances of mine have gotten divorced or are in the process. And it breaks my heart EVERY time I hear about another marriage falling victim to the heartbreak of divorce. It’s like when you’re driving past a really bad wreck on the interstate and you see the impact. You see the horrible wreckage and the number of cars involved, police cars, and ambulances. And then you keep driving and see the 5 to 10 miles of bumper to bumper traffic that’s stuck behind the wreck. I feel that same pit in my stomach when I hear about another family that’s being torn apart by divorce, and unfortunately I know the dark road that’s coming for them. I know how long that 5 to 10 miles of being stuck in traffic feels when you’re inching along through the grief process, just wanting it to end. I wish I had more guidance when I was going through it. I had an INCREDIBLE counselor and amazing friends but I wish there were more voices of those who had journeyed the same road I did and came out on the other side. The actual journey THROUGH the dark and lonely valley of divorce and being a single mom. Maybe you haven’t walked through divorce, but you do know what walking through a really hard season is like. The despair, the hopelessness, the feeling that you may never shake the loneliness. Your life might look a lot different from what you thought it was going to be. I know mine sure does, but it’s amazing to me to watch how God is unfolding His plan for my life. His good and perfect plan. He is a GOOD, GOOD Father — even if you find yourself in the midst of a divorce or a really hard season. So many women have courageously reached out to me, asking me for more insight, for more advice. I want these women to know that they aren’t alone. I felt like was the only one on the planet who was pregnant and going through a divorce, but since I’ve walked that road I’ve unfortunately met many more. Can I tell you that it frightens me to death? That I know I’m being called to step back into this place of vulnerability and sharing with you even more of my story, of how I handled the heartbreak of divorce. I don’t take it lightly. I’m sad that more people aren’t talking about the pain and heartbreak that divorce is causing marriages, especially marriages in the Church. It feels a lot like the big elephant in the room. So you know what? I’m writing to you, friends who may be going through divorce, or just got divorced, or are going through a dark season. You are not alone. You’re not walking through this season alone. God redeems it ALL. He won’t leave one piece of your broken or disappointed heart unhealed, but instead He holds them all and uses them to rebuild and RESTORE joy to you. Hold on to every promise He has made to us. So if you need a cheerleader or just to reach out to someone else who’s been there, join our Graciously Authentic community group on Facebook. I’d love to have you!